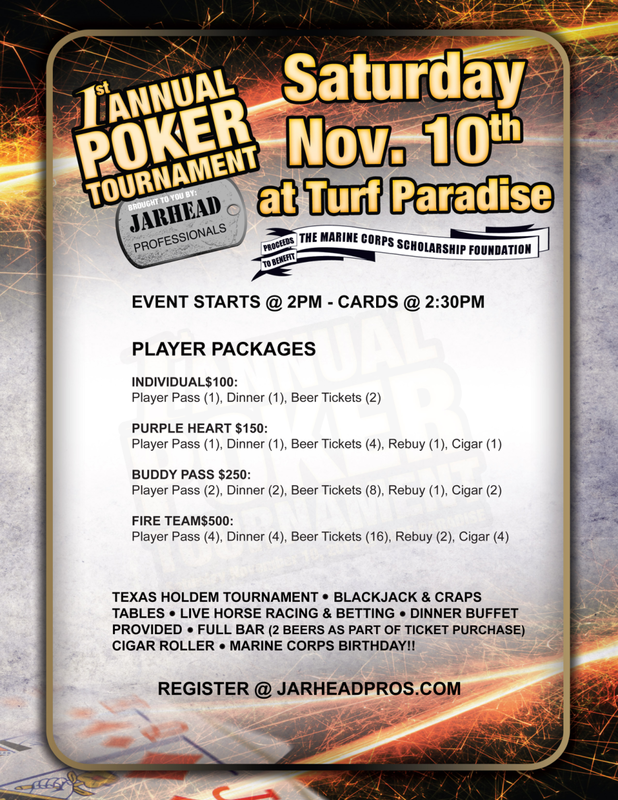 Join Jarhead Professionals for the 1st annual Texas Hold'em Fundraiser and casino night at the Turf Paradise Race Track. Proceeds to benefit the Marine Scholarship Foundation. The evening will include a Texas hold'em tournament, blackjack & craps, live horse racing, dinner buffet, full bar and cigar roller. Help celebrate the Marine Corps' birthday while raising money for this great cause. Location: Turf Paradise Race Track, 1501 W Bell Road, Phoenix, AZ 85023. For more information and to purchase tickets visit Jarhead Professionals or On the Go Casino® Parties Facebook Events or contact Andy at andy@jarheadpros.com.